I was passing through the Mojave Desert and by chance stopped by a local thrift store in Joshua Tree. I'm glad I did, because I spotted a book that I just had to own. At $0.50, it was priced to sell. And as you can tell from the title above, the book's a classic. It's bound to remain fresh and relevant through the ages—not as a useful guide to homeownership, but as a fossil record of the biggest real estate scam in the history of the United States. A lot of people still wonder how and why so many millions of people bought such ridiculously overpriced homes and took out mortgages and loans they clearly could not afford? Extra! Extra! 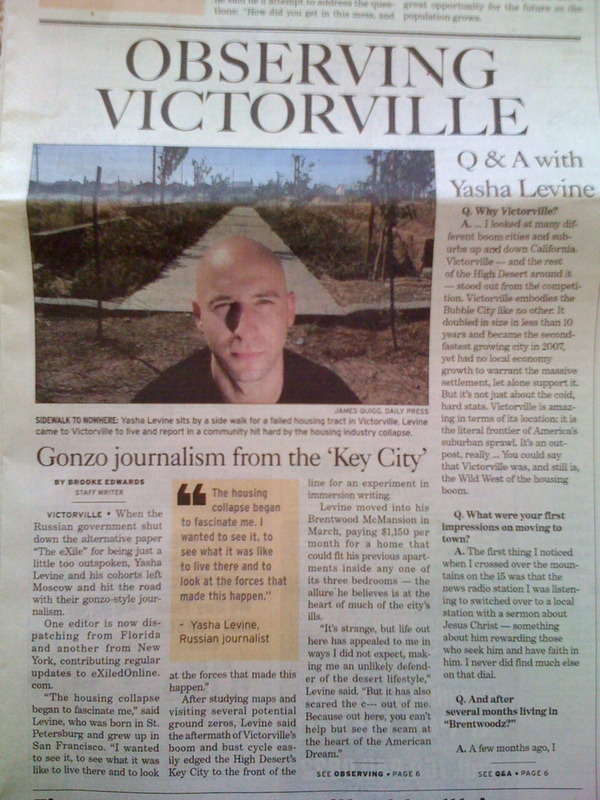 Yasha Levine makes frontpage news in Victorville! That's what I kept wondering when I moved out to Victorville back in the Spring of 2009 to do immersion reporting from the front line of the real estate meltdown. Located about 100 miles east of Los Angeles on the edge of the Mojave Desert, Victorville got higher and crashed harder, in terms of real estate, than almost any other place in California. It doubled its size to 100,000 in just eight short years, growing from an isolated hick outpost into a booming commuter suburb filled with the cheapest McTractHomes south of Fresno. By the time I got there, Victorville was a ruined city filled with empty master-planned communities, some of them half-built and abandoned, rotting in the sun. I spent nearly two years reporting on the real estate swindle out there, and I never could stop thinking about the central question: How the hell were people coerced into moving out here? Why would anyone think that buying a $500,000 house in a desert 100 miles away from Los Angeles be a good idea, no matter what kind of loan deal you got or how booming the market. What kind of propaganda were these people subjected to? Well, this book provides a part of the answer: people were explicitly instructed to do so. 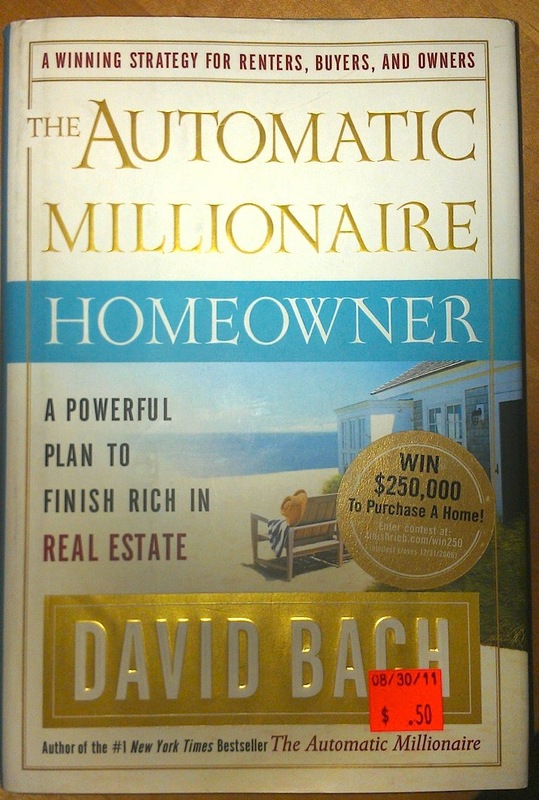 The Automatic Millionaire Homeowner hit the front bookcase displays at Barnes and Noble in March 2006, at the very top of the real estate market and just a few months before the whole thing crashed and burned. Its main message was simple: If you take out a mortgage to buy a home, you will always make money. There is no way you can lose—no matter when you buy, how much you pay or what type of loan you get. And the kicker is, both the book and the financial expert who wrote it were bankrolled by Wells Fargo and Bank of America. This book is just one of dozens—if not hundreds—of similar self-help snake oil guides promising a sure bet system to get rich in real estate. But it's a good example of the massive propaganda effort financed by Wall Street that was designed to funnel as many people as possible into the mortgage meat grinder. The book was packed with blatant lies that seem so obvious and even comic in retrospect. The book was not put out by some shady fly-by-night operation, but by a supposedly credible financial expert who had the backing of the most well-known and respected banks, TV networks and newspapers. But the whole thing was a fraud, shamelessly boosted by some of the biggest names in news media—none of whom have been held accountable for their role in defrauding millions of Americans. What if I told you the smartest investment you would ever make during your lifetime would be a home! What if I told you that in just an hour or two I could share with you a simple system that would help you become rich through homeownership? Would you be interested? Would you be willing to spend a few hours with me? Would you like to become an Automatic Millionaire Homeowner? As I sit here in August 2005, I have no idea when you will be reading what I'm writing. Maybe it's March 2006 (when this book is scheduled to be published)—by which time the real estate market could be slowing or cooling down to modest single-digit annual gains (or not). Perhaps this book was bought by a friend of yours who passed it along to you—and it's now 2007 and those once "certain" boom markets are going bust due to speculation. Or maybe the opposite has happened—interest rates have remained at historic lows, and home prices have continued their march upward. ■ You don't need a big down payment to buy a home. ■ You don't need great credit. ■ You should buy even if you have credit-card debt. ■ You can buy a second home even if you're still paying off the first. ■ You can get started in any market-boom or bust. ■ It's easier to be a landlord than you think. 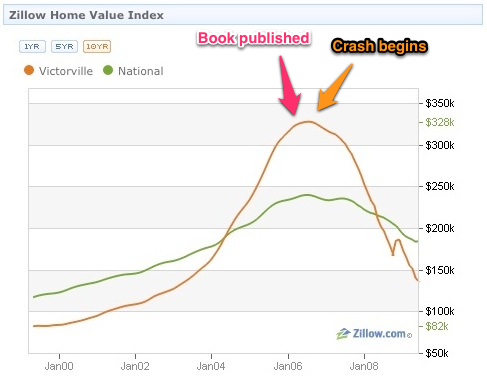 Just a few months after the book came out, the real estate market went into a death-spiral. Victorville and other Mojave Desert exurbs like Palmdale and Lancaster were packed to the brim with people who followed this book's advice to the letter. They took out no down payment adjustable rate mortgages, bought at the peak of bubble, had horrible credit scores, were struggling to make ends meet and were probably up the hilt in credit card debt. Over the next year and a half, home prices collapsed by 30% and just kept falling. By the time that I packed my bags and fled West towards the Pacific Ocean in 2010, homes that had sold for nearly $400,000 at the top of the market in 2006 couldn't find a buyer at $50,000 or $75,000. People were kicked out of their homes, lost all the "investment" payments they had made on their loans and had to find other places to live—rental homes if they were lucky; cars or tents at the hobo camp down on the banks of the Mojave River if they weren't. So the Automatic Millionaire was a bust—well, at least as far as the now-former homeowners were concerned. But as we now know, the latest home-ownership craze was never meant to benefit the homeowners. The only Automatic Millionaires it created were David Bach and the financial oligarchy he served. 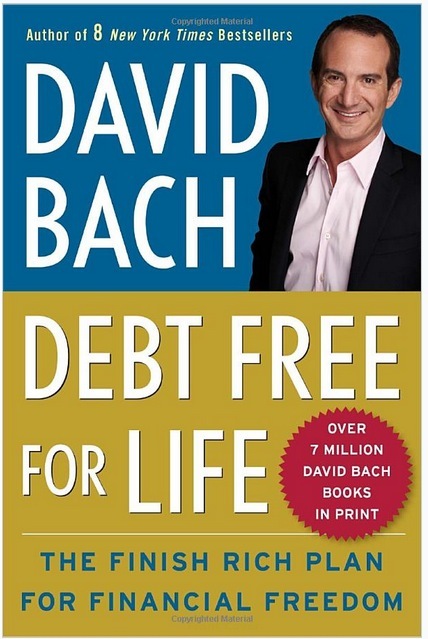 See, before David Bach began his bright career as a New York Times bestselling author dedicated to spreading the gospel of homeownership, he was a senior vice president of Morgan Stanley and a partner of The Bach Group, a wealth management outfit started by his father. Yep, he was born into it. Finance runs through his veins! So it's no surprise that both Bank of America and Wells Fargo sponsored David Bach and his revolutionary Automatic Millionaire Homeowner wealth-creation system. DES MOINES, Iowa - Oct. 28, 2005 - Wells Fargo Home Mortgage today announced a three-year agreement with financial coach David Bach, author of several best-selling books including No. 1 New York Times best-seller The Automatic Millionaire. The partnership is designed to increase the number of first-time, second-home and investment homebuyers and help homeowners best manage the equity in their home as an asset to achieve their long-term financial goals. Yep, Wells Fargo is interested in educating homeowners for the greater good. And the bank is not alone. Just look at all the smart people who praise and recommend Bach's work. They wouldn't lie, not with their reputations on the line! Jean Chatzky, Financial Editor of NBC's Today, blurbed: "The Automatic Millionaire gives you, step-by-step, everything you need to secure your financial future. When you do it David Bach's way, failure is not an option." Fox's Bill O'Reilly also endorsed the Automatic Millionaire wealth creation system: "David Bach's no-spin financial advice is beautiful because it's so simple. If becoming self-sufficient is important to you, then this book is a must." Yep, this is the same O'Reilly who bashed homeowner "losers" who took out loans that they weren't able to pay, and yet here he is endorsing a plan that says there's no such thing homeowner who loses money. Wonder what kind of cut Bill gets off Bach's loot? He rips you off, puts you in debt and sticks by your side to help make sure you pay it off. What a guy! So what's up with David Bach today? The man's still doing regular TV gigs and giving financial advice to unsuspecting victims, including a weekly appearance on NBC's Today Show. But he's changed his racket: Bach's no longer out to make automatic millionaires; these days he's motivating debtors to get second/third jobs and convincing them to adopt austerity measures in their own personal lives. He'll help you pare down your consumption footprint to the bare minimum necessary for physical survival. Yep, Bach's our debt handler. His job is to make sure we peons keep making those monthly payments to Wells Fargo and Bank of America! The day that degenerate shysters like David Bach are afraid to show their faces in public and feel the need to flee across the border is the day that we'll know that we as a country are making progress towards a brighter future. Yasha Levine is a co-founder of the S.H.A.M.E. Project. 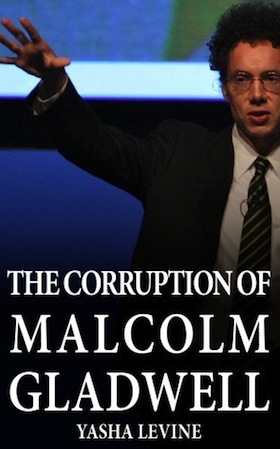 Read his book: The Corruption of Malcolm Gladwell.